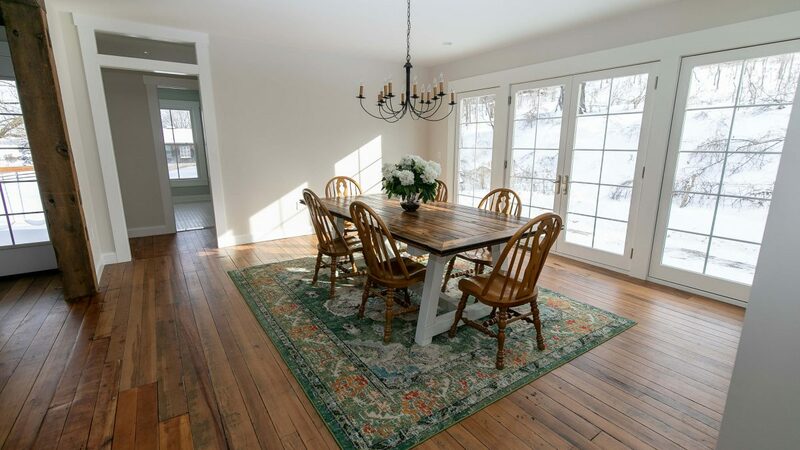 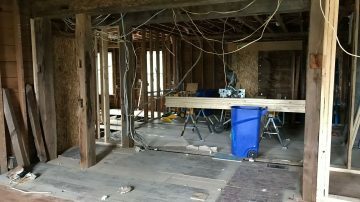 We’re bringing you our second historic farmhouse renovation of the year, the Stanton Project! 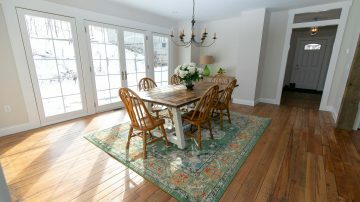 Greg and Melissa Stanton wanted to turn a very outdated farmhouse in Avon, New York into their long term family home. The home was in rough shape when they purchased it, but the family fell in love with the location (just a mile away from downtown Avon), the character of the home, and the charm of the 3.5 acre property with a large barn. 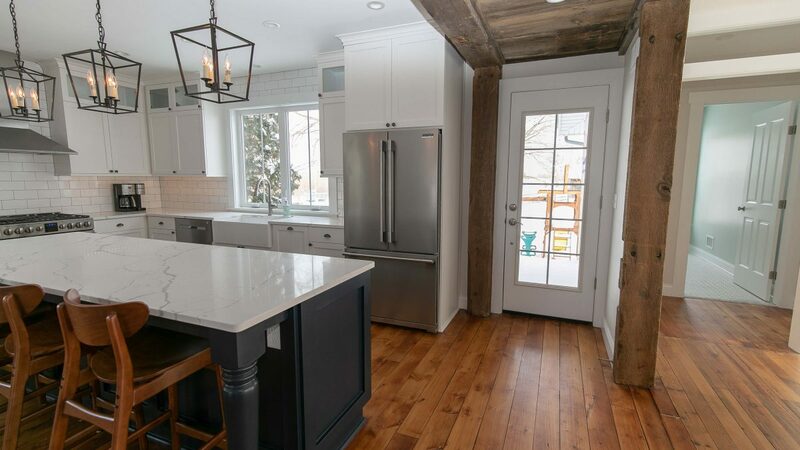 They felt the farmhouse was a diamond in the rough, and with a lot of love and vision, it would make the perfect home to raise their children in. 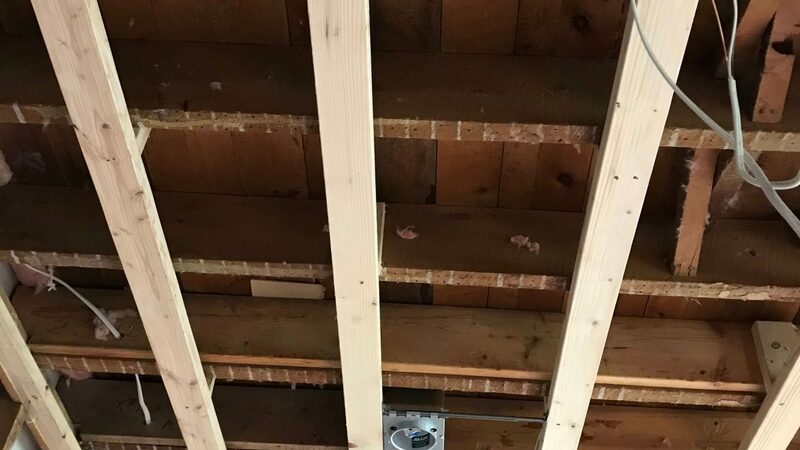 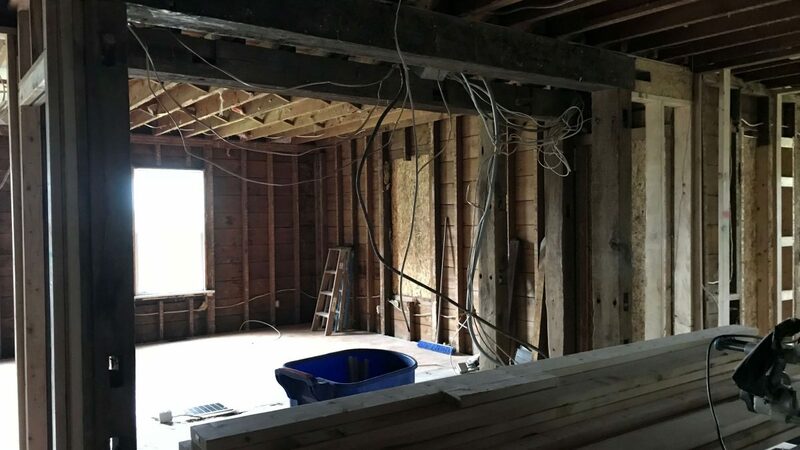 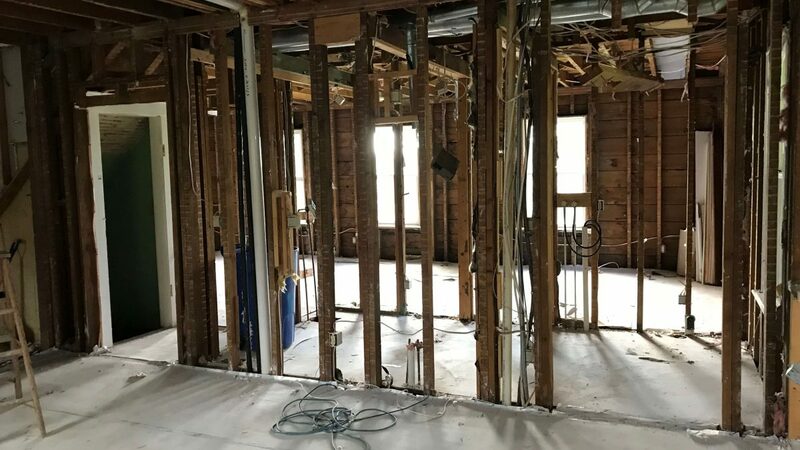 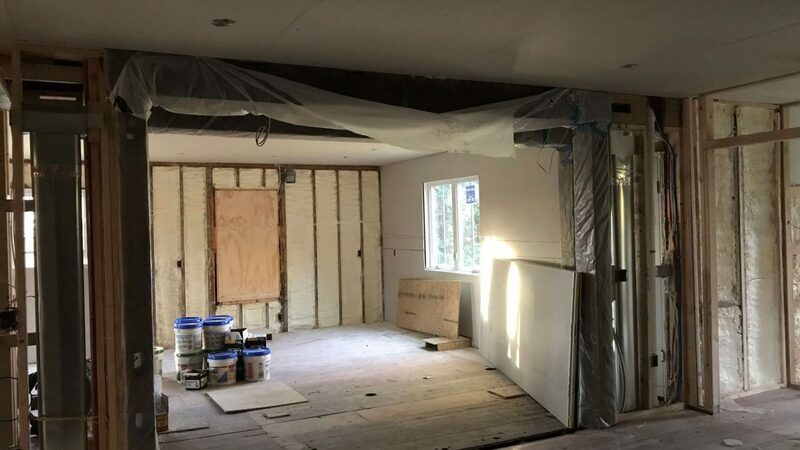 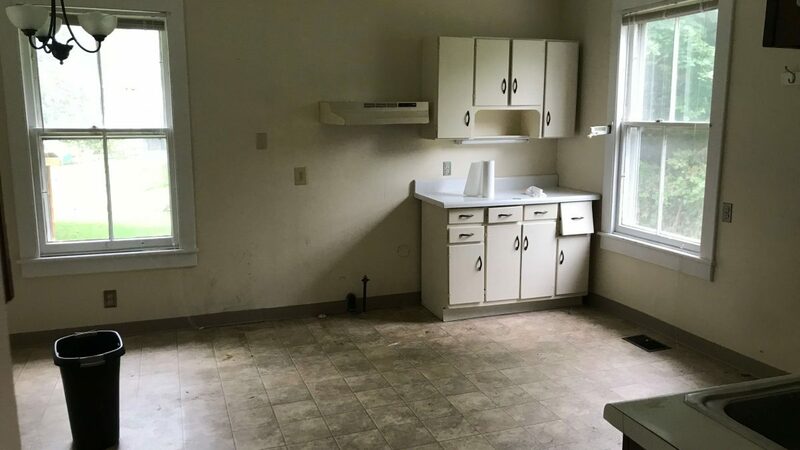 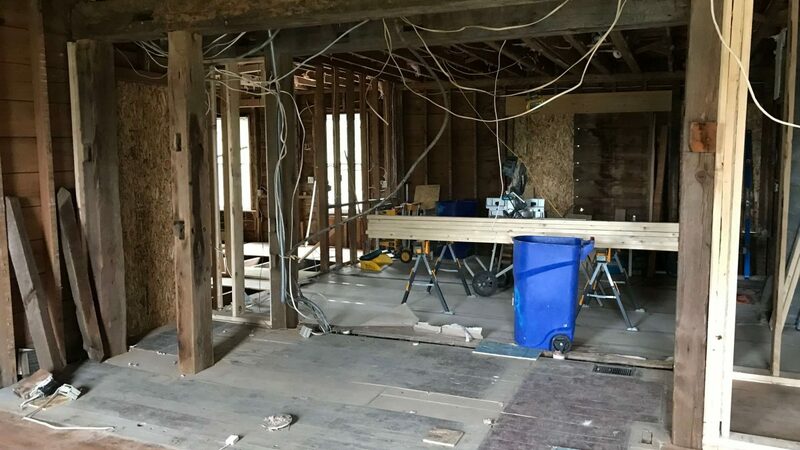 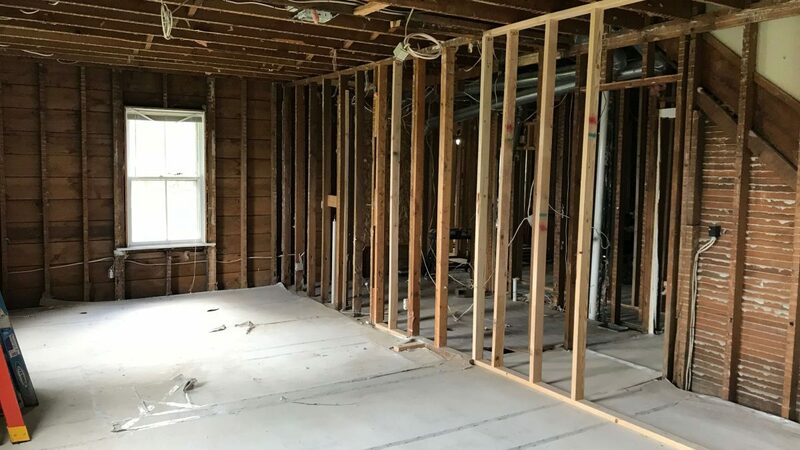 Greg and Melissa Stanton recently purchased a dilapidated farmhouse situated on 3.5 acres as their family home, but it came with a rather large problem: the farmhouse was split into two apartments to accommodate two families. The Stantons’ top priority was opening up the first floor of the farmhouse to create a space that would suit their family. 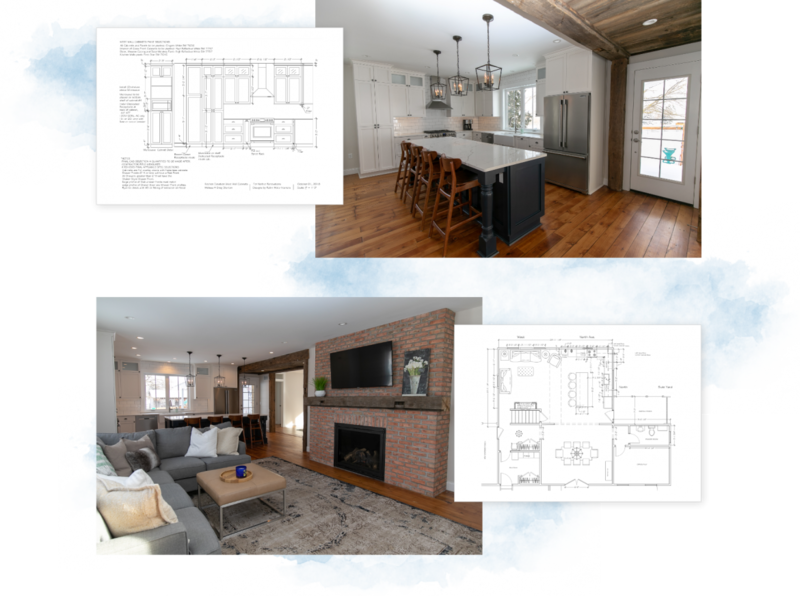 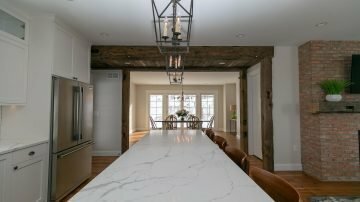 Keeping the original feel of the farmhouse was very important to the family, and they wanted to incorporate as many modernized farmhouse details as possible. 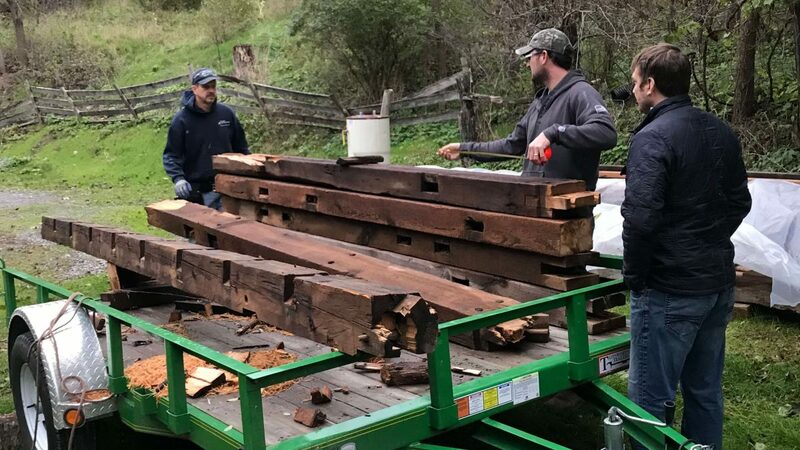 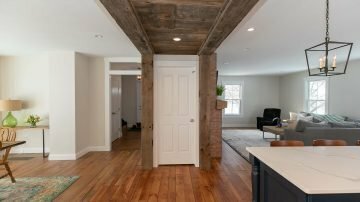 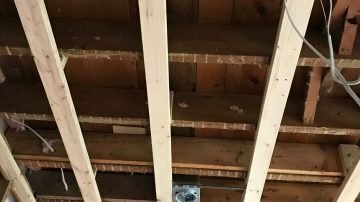 The property they purchased had a barn behind the home and the Stantons immediately knew they wanted to bring barn wood from the structure into their main living area. 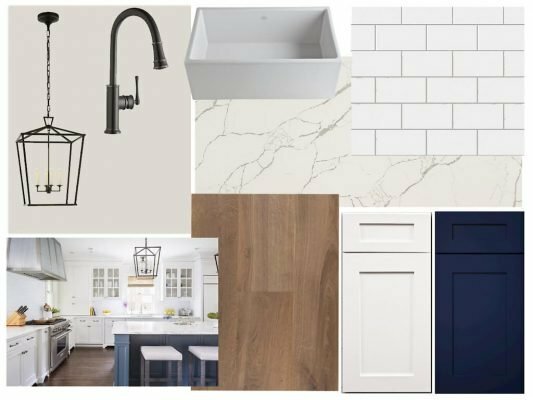 We scoured their Pinterest boards and discovered color palettes, styles, and details that appealed to the family, then spent a few weeks intricately planning out every part of their project. 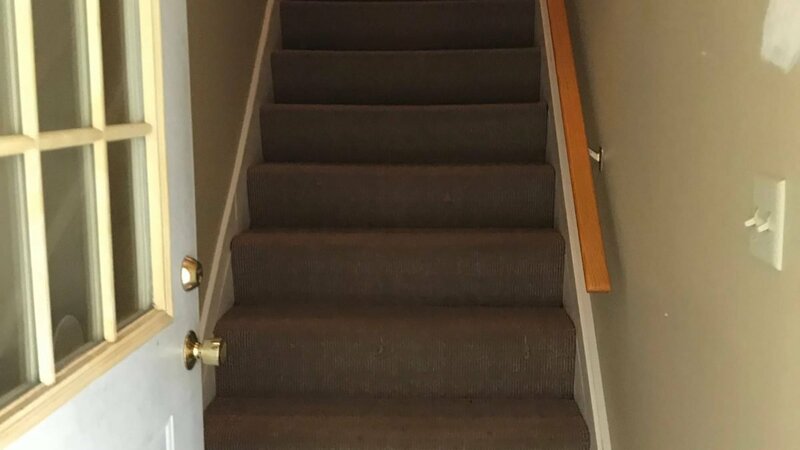 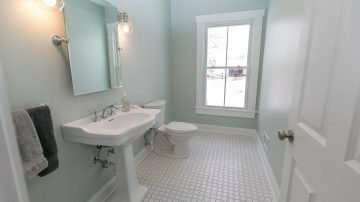 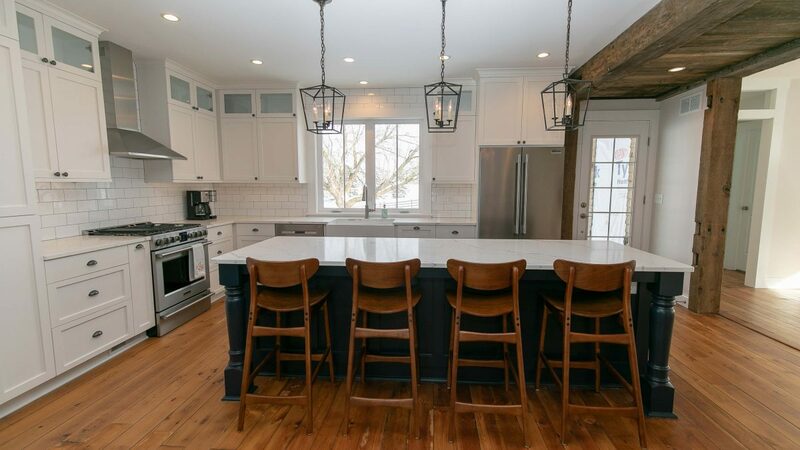 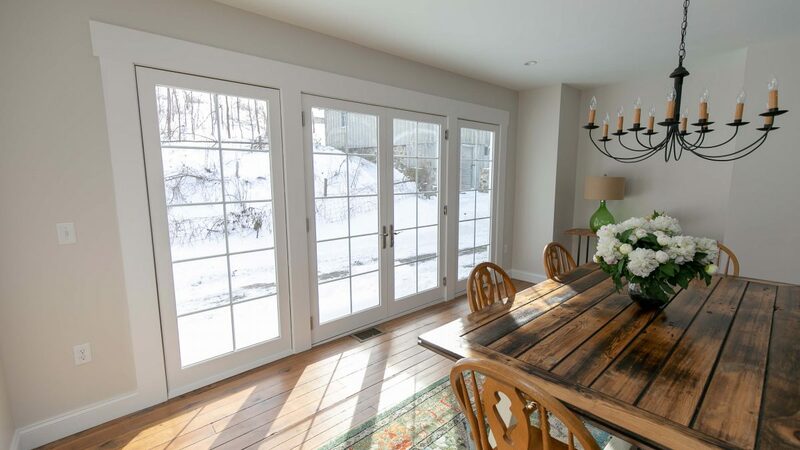 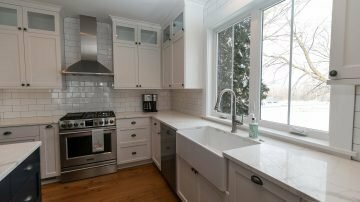 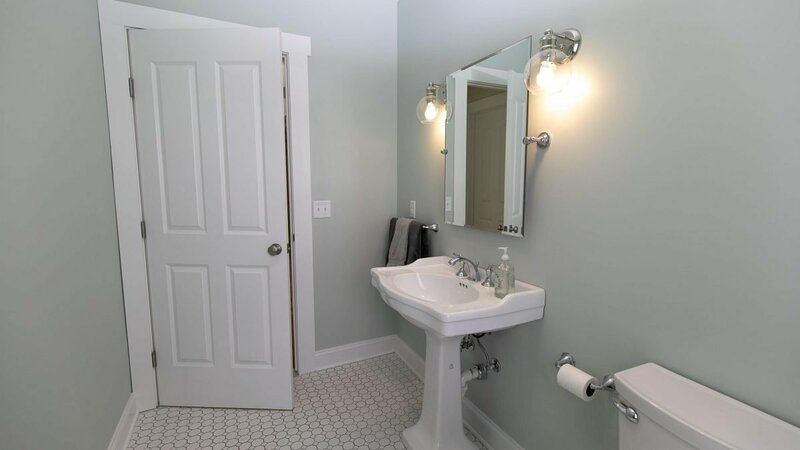 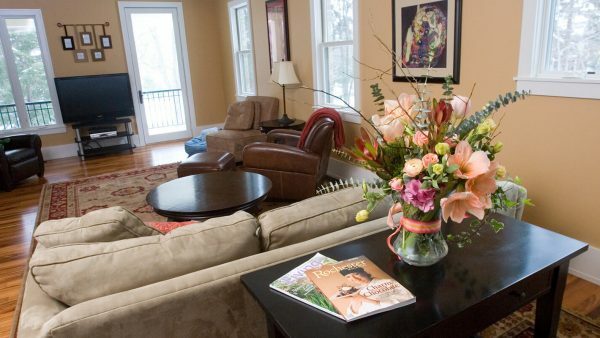 We renovated the entire first floor of their home, including the kitchen, living room, dining room, and powder room. 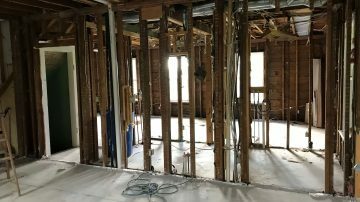 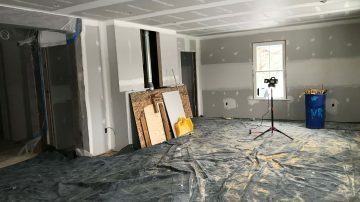 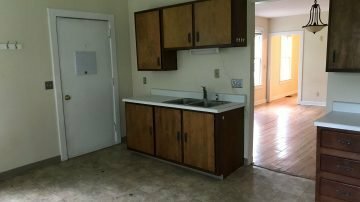 We also had to take into account new plumbing and electrical systems, windows, drywall, and lighting throughout the space. The farmhouse had last been renovated in the 1950s, so it was long due for some stylistic upgrades as well. 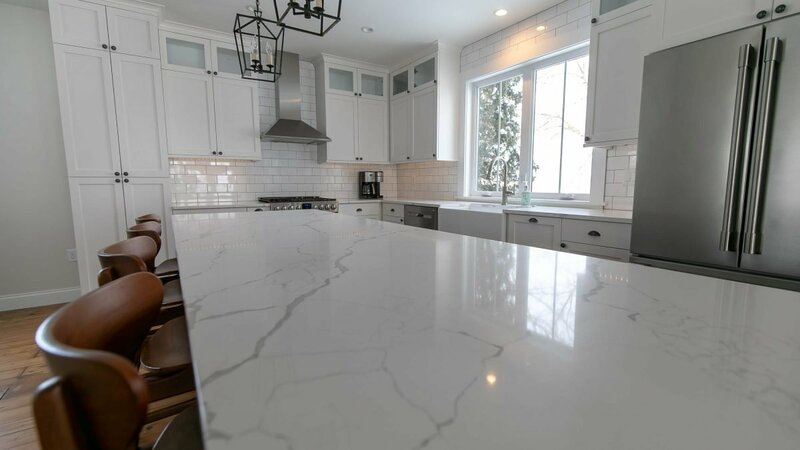 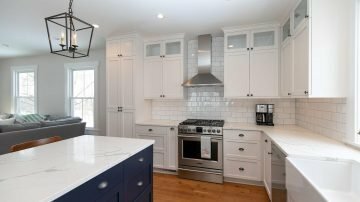 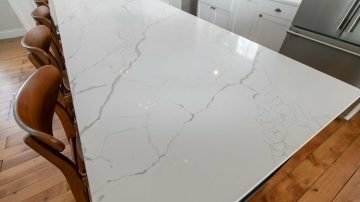 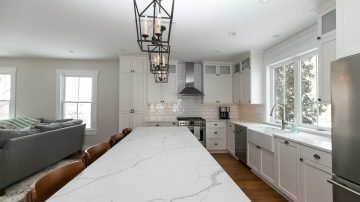 Beyond moving the kitchen to a whole new location in the home, the Stantons wanted to upgrade the look, feel, and function of the space. 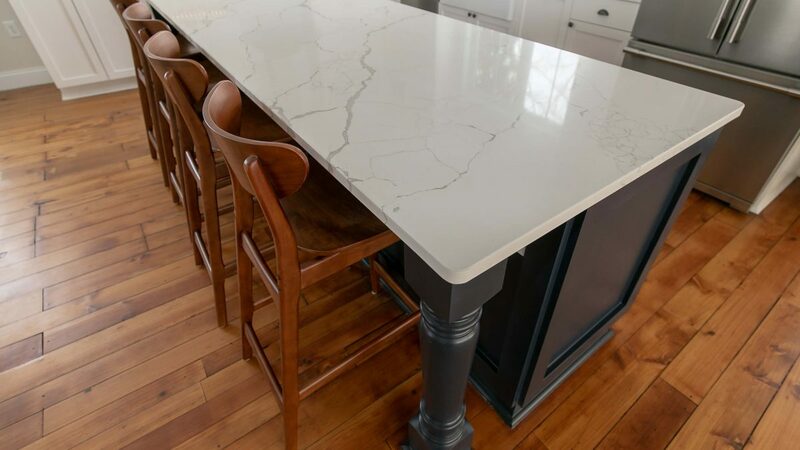 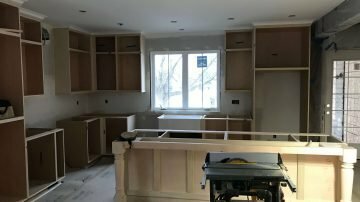 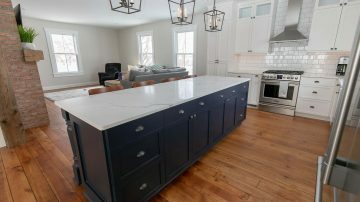 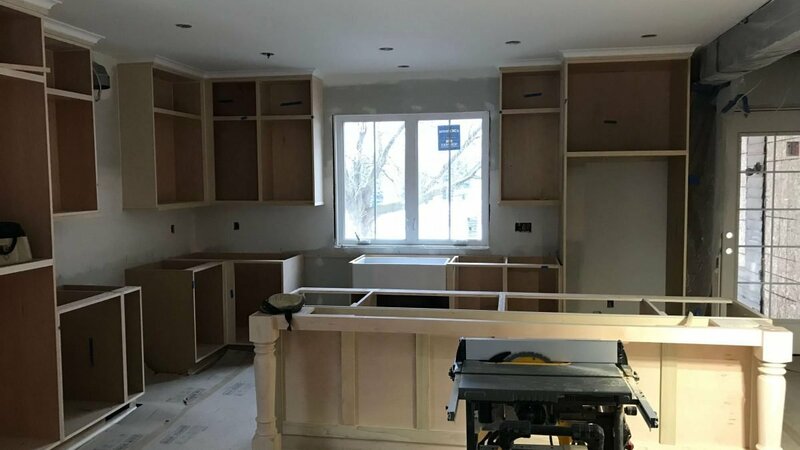 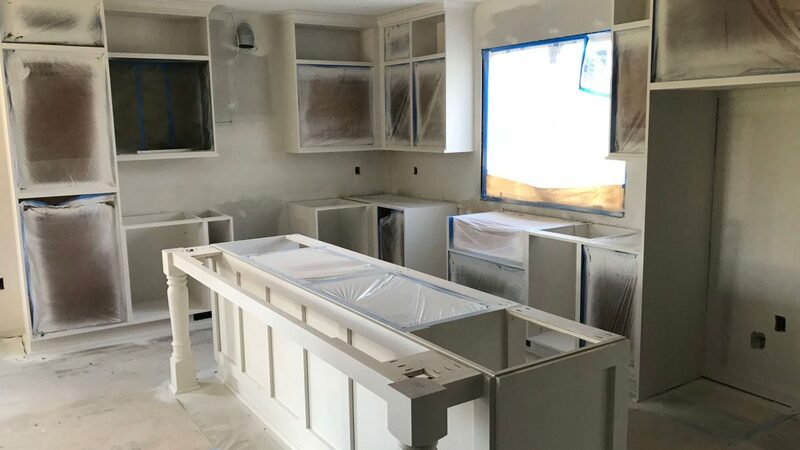 We built custom cabinets and a 9-foot, completely custom kitchen island that allowed the Stanton’s to look out onto their land while working in the kitchen. 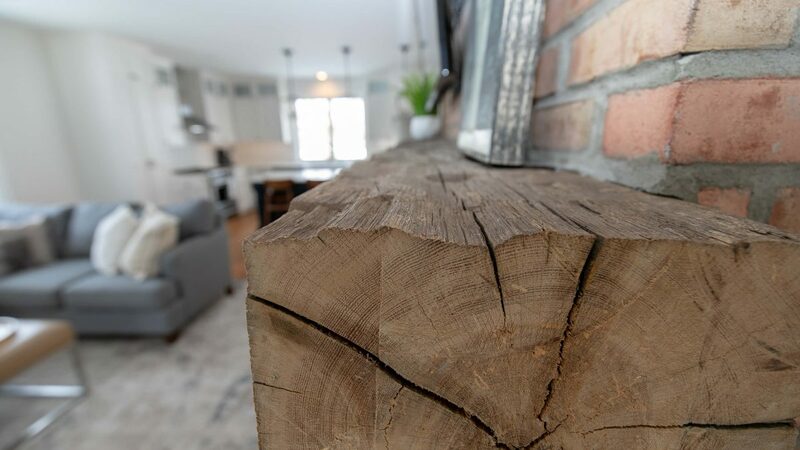 Using wood collected from the Stantons’ antique barn, we constructed a unique door-to-ceiling accent piece, as well as their living room mantle. 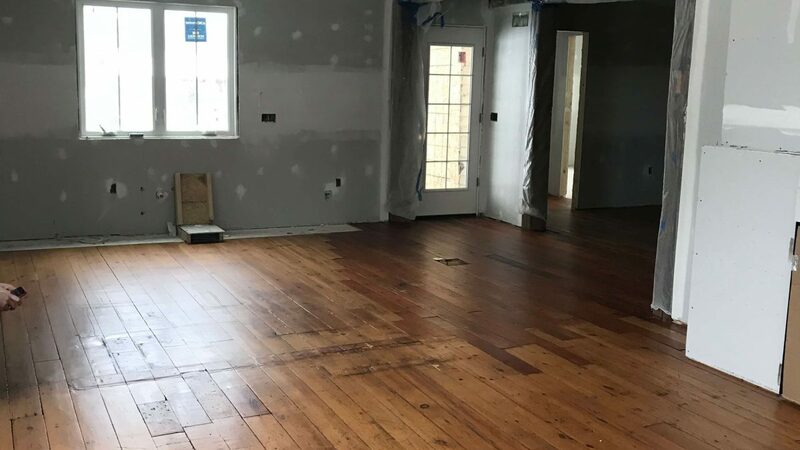 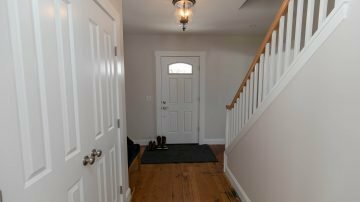 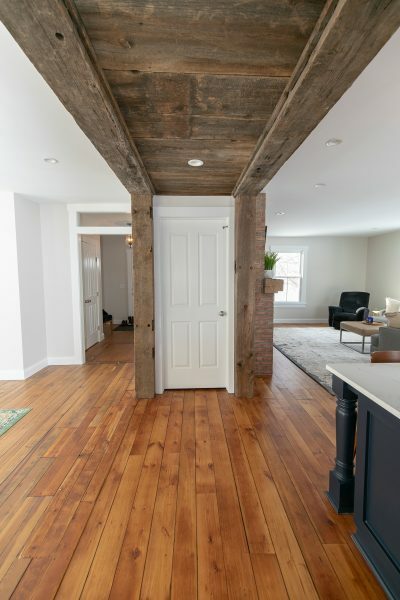 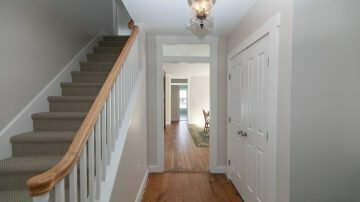 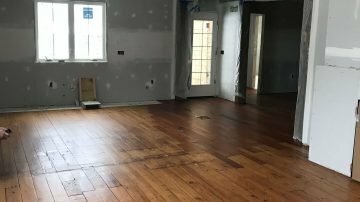 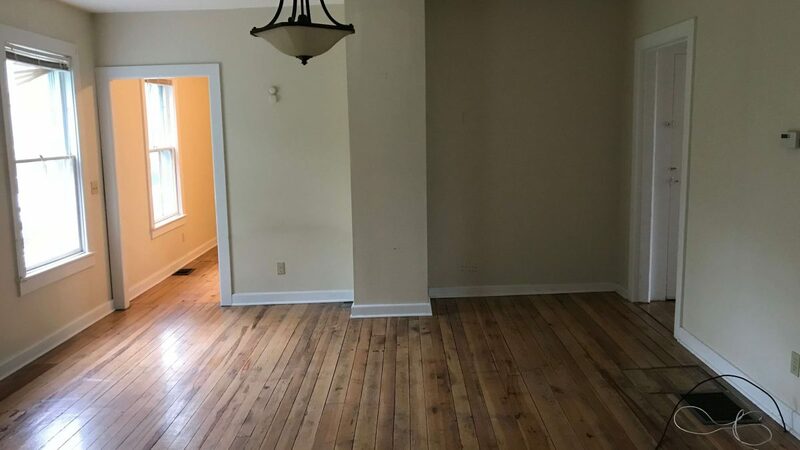 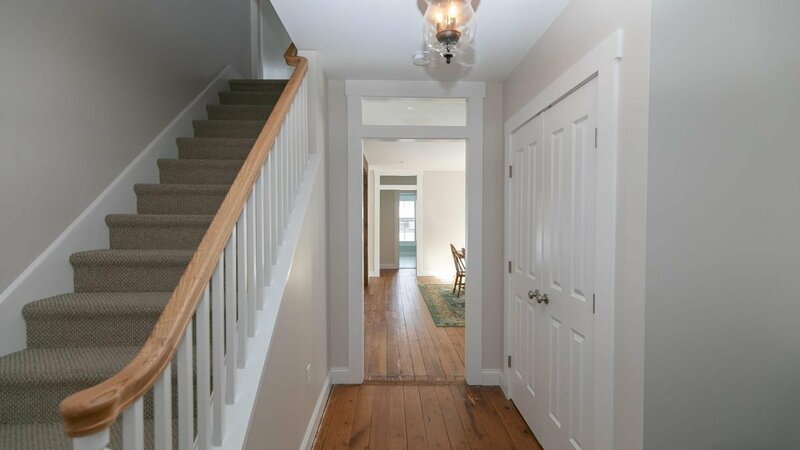 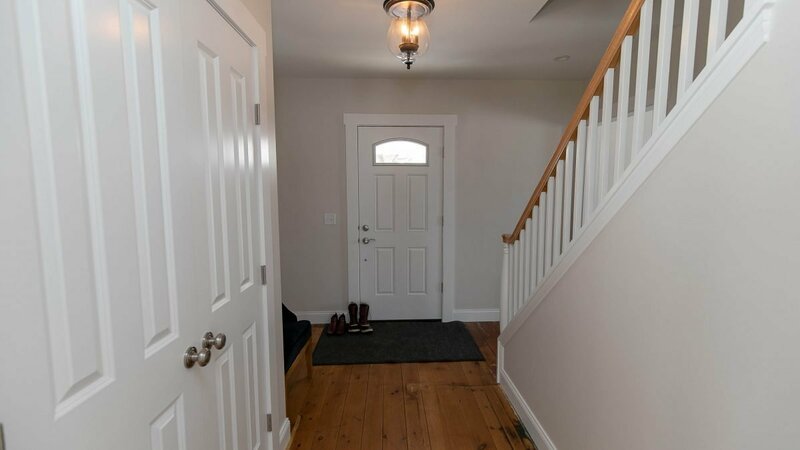 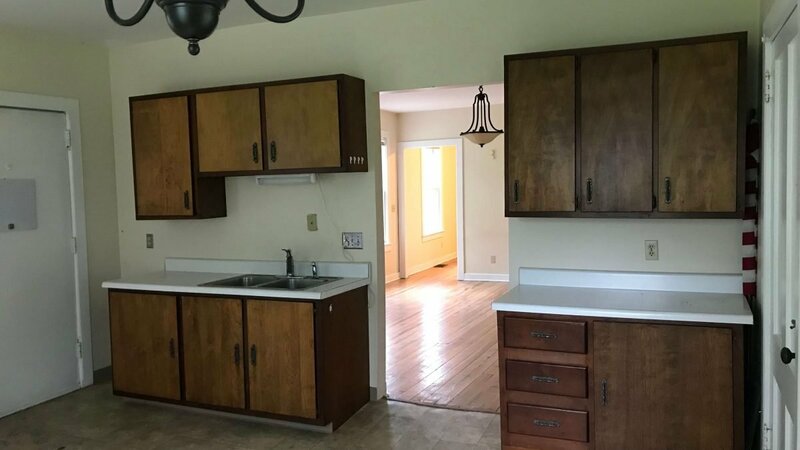 The Stantons also opted to keep the original hardwood floors, preserving the same farmhouse look the original owners had imagined. 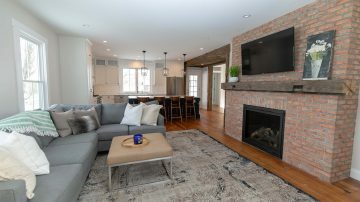 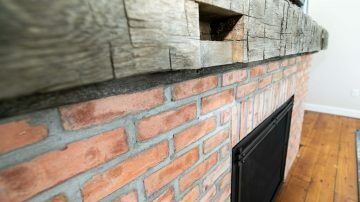 Around the fireplace, we searched high and low to find the right brick for the space. 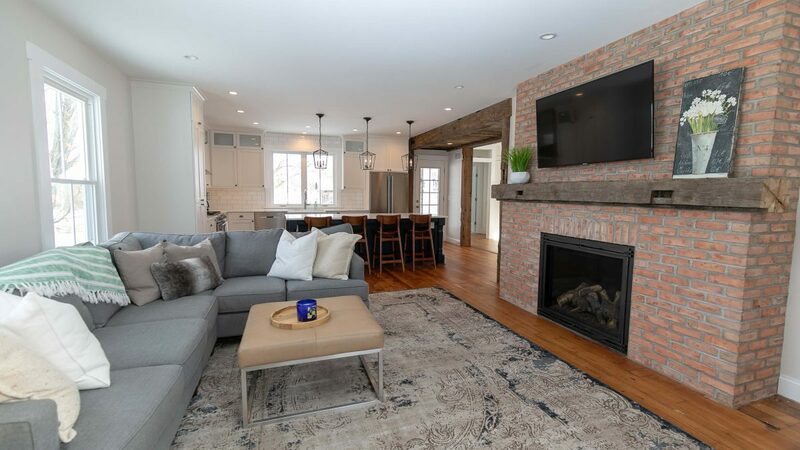 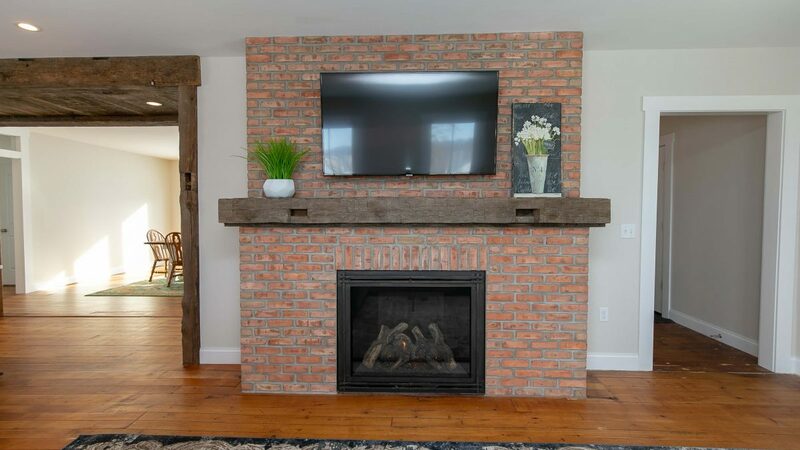 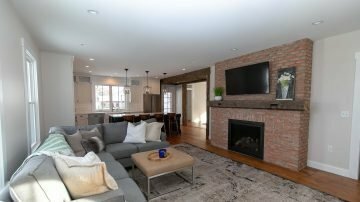 Melissa and Greg wanted brick that looked vintage, and we finally settled on this beautiful Danish thin brick to create a statement piece for the room. 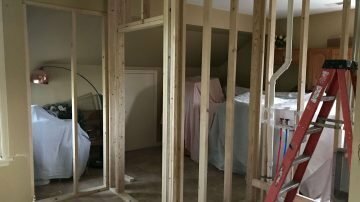 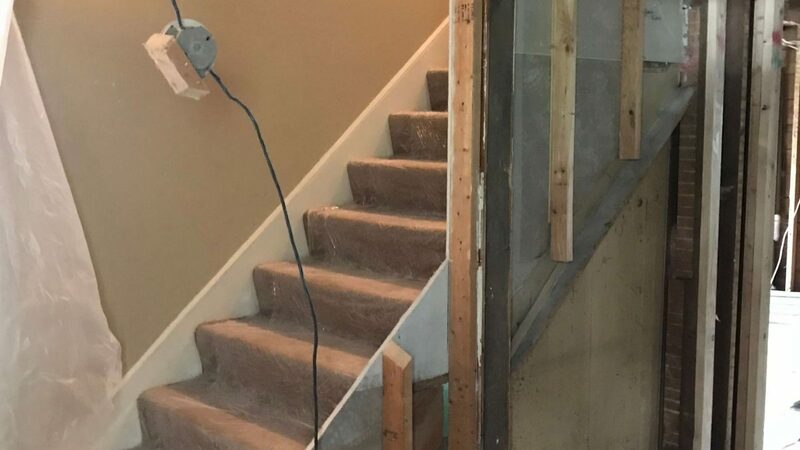 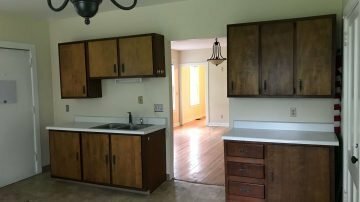 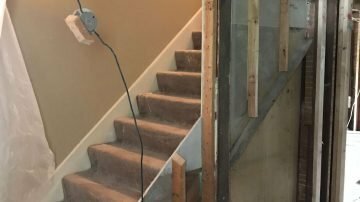 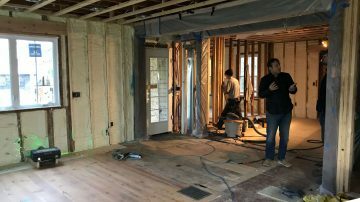 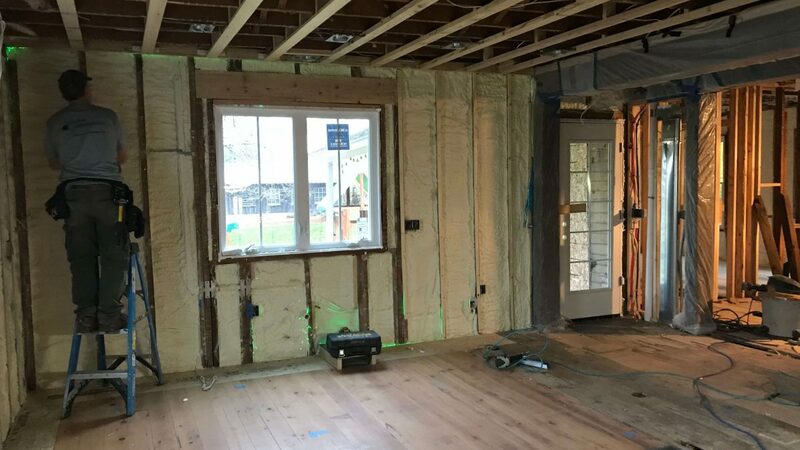 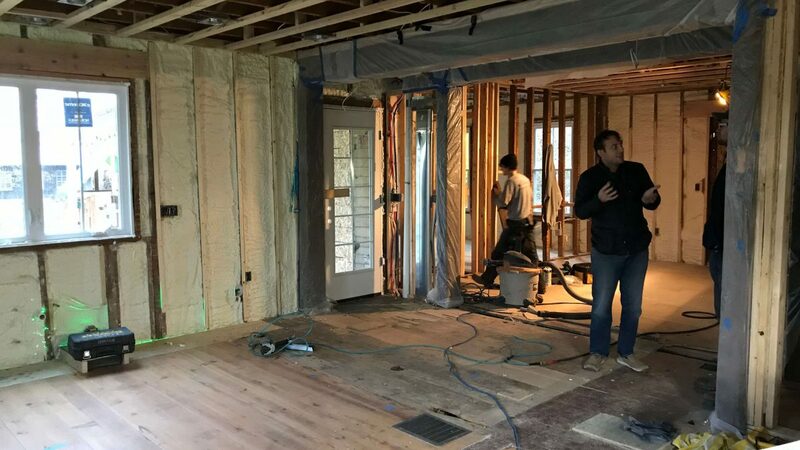 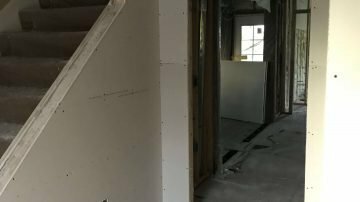 Melissa noted that because they wanted their home to be renovated before they moved in, it was critical the renovation stuck to its timeline. They had just welcomed a new baby into their family, and the family of four did not want to displaced for long. 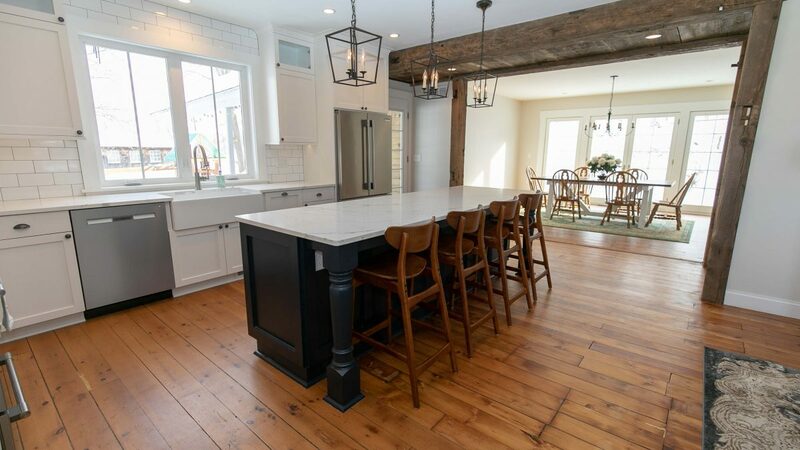 The final result is a beautifully restored, livable, and modern farmhouse that has a warm and welcoming feeling. “We loved working with the Norbut team; it was such a great experience and we have plans to work with them in the future. 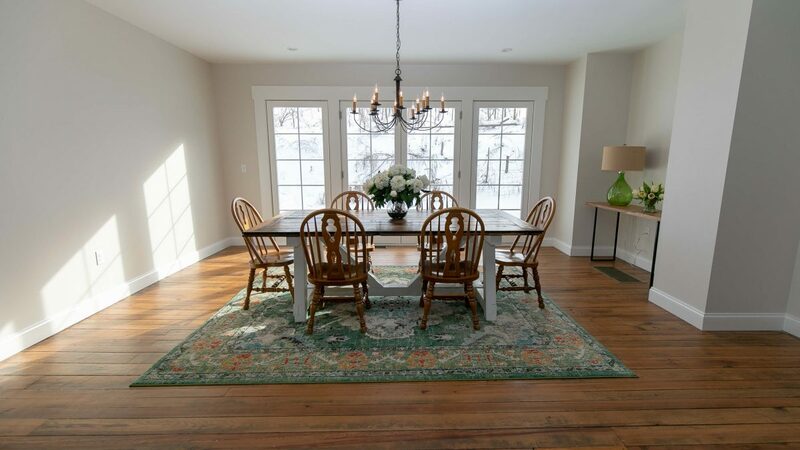 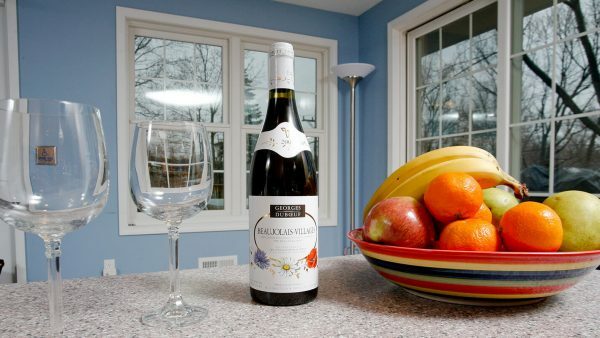 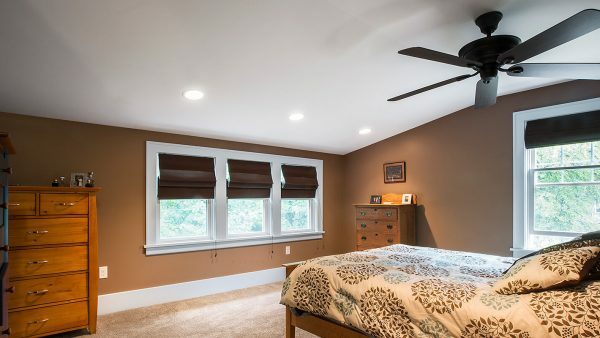 They did a wonderful job on our family home and we are extremely pleased,” said Melissa. When people visit the once run-down farmhouse, the Stantons said they are now “wowed” by what they see and are shocked to see how everything came together.